Cayenne Pepper Concentrate - Rated at 200,000 Heat UnitsCaution: Use With Care - Extremely HOT! Through centuries, herbalists have found Cayenne to be the most beneficial and useful of all herbs for the heart and circulation as well as digestion. No other herb can rocket blood flow as completely and rapidly as Cayenne. Capsaicin is the active ingredient in Cayenne that makes it hot. The hottest Cayenne may feel like fire but actually causes no damage whatsoever. Cayenne can be found in many of our herbal tinctures and cleanses, as it is known to increase the effectiveness of other herbs. It is also contains valuable nutrients including vitamins A, C, the complete B complexes, organic calcium and potassium. Cayenne helps your circulation by removing blockages, allowing nutrients and oxygen deep into your tissue. Carrying away wastes and toxins from the cells is the reverse side of circulation, assisting the blood in its cleansing as well as nourishing action. Hot and spicy, cayenne dissolves mucus in the lungs and throughout the body so it can be passed out more quickly and easily. Adding Cayenne Concentrate to your daily regimen is perfect to support an Alkaline or Mucusless Diet. Cayenne also helps to strengthen and rebuild tissue in the digestive system while increasing muscular action in the intestines. Cayenne helps the stomach produce more hydrochloric acid, which is essential for digestion of proteins. You will notice we add Cayenne to our Intestinal Cleanse Products not only because it aids digestive and elimination, but also because it enhances the other herbs. Cayenne Concentrate can support your metabolism, immune system functions and body temperature since these also depend on healthy blood flow. These statements have not been evaluated by the FDA. Individual results taking herbal preparations vary, and similar results are not guaranteed. This information is for educational purposes only and is not intended to diagnose, treat, cure or prevent any disease. Consult with your health practitioner if you have a health problem before using this or any dietary or herbal supplement. I am very glad I was introduced to Cayenne Concentrate. I cannot wait to try your other products. - R.C. I was prescribed Cayenne Concentrate by my doctor to help with detoxifying from heavy metal poisoning as it increases circulation. I take two drops in the morning and two drops when I go in the sauna. It handles my cramps too; they go away when I take it. - D. M.
I take 1 to 2 drops in tea daily. That keeps my body warm - improves the circulation my hands and feet as they tend to be cold. My husband has a warm body and he drinks green tea to cool it, while I drink tea with Cayenne to warm my body. The Cayenne is great for circulation.~ Vanessa B.
I use the Cayenne drops and I put the powder in food. It works! I was a sweet-a-holic and that turned me into a diabetic. This turns me the other way. I use it to help open up all the pathways that get restricted for blood. It helps me lose weight also. The powder is perfect. Hot and spicy, and it works. Iï¿½d recommend it to anyone. ~R.K. I have been using cayenne concentrate for around 9 years-daily. I take a few drops in my 1st cup of green tea in the morning. It gets my blood circulating which is especially good in winter. I take a little extra when I travel to keep my circulation running smoothly especially on long flights. I use a little for headaches occasionally. Ingredients: Organic Red Habanero, African Bird's Eye and Scotch Bonnet peppers in a base of distilled water and certified organic GMO-free alcohol. Cayenne Concentrate is taken internally as a supplement. The gentlest way to take the cayenne tincture is by mixing drops into coconut or olive oil before swallowing. You can also take Cayenne Concentrate directly in your mouth under the tongue for the fastest absorption. Allow one drop to fall underneath your tongue. Hold it there for one full minute. Then swallow it. Don't drink anything for a few minutes afterwards to absorb it fully and not dilute it. You can build up your tolerance and increase the number of drops each time. 6 drops should be sufficient; if you take more, it will not feel hotter after 6 drops. Water will increase the "burn" effect, dispersing the capsaicin all around the mouth. If you can't handle the heat, don't drink it with water nor follow it with water. Capsaicin dissolves in oil not water. Better to take a spoonful of healthy oil or avocado after taking the concentrate. Or eat a small piece of food with oil or butter on it after taking some drops of cayenne concentrate to absorb and attract the cayenne oil and dilute its heat. 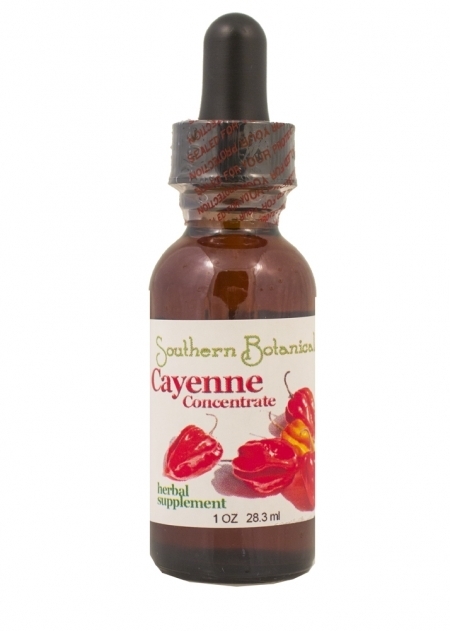 Cayenne Concentrate can also be added to your other herbal tinctures with benefit. Put 1 or more drops into a shot glass with another herbal formula you take, and down it together in one swig. this will enhance the effects of the other herbs while also reducing the heat of the cayenne in your mouth. Contains Cayenne: Avoid getting Cayenne on hands, skin or in eyes as it feels hot (but it does NOT cause tissue damage). Wash hands well if there is contact and avoid touching the eyes. Vinegar can help remove it thoroughly from the skin. Cayenne does pass into breast milk, so nursing mothers should avoid Cayenne. Cayenne may lower blood sugar levels, raising the risk of low blood sugar or hypoglycemia. Ask your doctor before using Cayenne if you have diabetes.